In stock -This product will ship today if ordered within the next 7 hours and 12 minutes. Turmeric is known for its versatility. Golden Turmeric Tea is a great choice for a fit immune system. This tea shimmers with a rich yellow colour and has a fragrantly spiced and full-bodied taste. Refine with a small sip of (plant-based) milk for an excellent alternative to coffee. Also a wonderful companion for tasty cheese platters and colourful vegetable stir-fries. From organic farming: turmeric 48%, Ceylon cinnamon, cardamom 13%, ginger 11%, coriander, fennel, vanilla, licorice, cloves, black pepper. Pour approximately 200ml of boiling water over a tea bag, steep for 5-10 minutes and the drink is ready for you to enjoy. 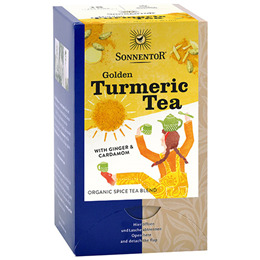 Below are reviews of Sonnentor Organic Golden Turmeric Tea - 18 Teabags by bodykind customers. If you have tried this product we'd love to hear what you think so please leave a review.